What was once a neighborhood characterized by its affordable property values and family-run restaurants has transformed into a rapidly-developing market filled with million-dollar homes. In 2018, the average sale price in South Boston skyrocketed to $803,513, up 10% from 2017 and 86% from 2008. South Boston’s housing market is booming, with 55 transactions currently under agreement and average days-to-offer at just 20 days. South Boston’s housing market is shifting out of reach for working-class adults and into the territory of elite young-professionals. Ten years ago, only 3% of the 419 condominiums sold were priced between $700,000 – $1,000,000. Almost all condos were selling under $699,000, with a huge portion under $349,000. Last year, 278 condos, or 45% of all inventory was listed within the 700,000-1,000,000 range. These exorbitant prices keep condominiums as a distant aspiration for young adults looking to establish themselves. In 2008, a $429,500 investment could get someone a new construction two-bedroom condominium with a private roof deck and other state-of-the-art amenities. For the same price in today’s market, buyers won’t even be able to find a single listing. While the condominium market is certainly experiencing dramatic growth rates, it may be nearing a cooling point in price growth. For the first time since 2013, listing prices have surpassed the asking prices, indicating that there is less competition in bidding for these coveted condominiums. Given its proximity to the Seaport and the surplus of upcoming housing in Washington Village, South Boston will remain a highly demanded sub-market for young-professionals. As prices continually to rise, it may seem unlikely one will be able to find a reasonable priced condominium for sale, but there are still affordable options out there. Like Charlestown, the average price per square foot is markedly more affordable when purchasing a 3-bedroom condominium. These three-bedroom spaces have nearly double the average living area when compared to one-bedroom listings, with the 24 active three-bedroom spaces having an average living area of 1,553 and the 12 one-bedroom listings having an average of 873. The average listing price in Jamaica Plain in 2018 is $613,000, up 8% since last year. With just 35 listings on the market, and 42 under agreement in March (with the average days-to-offer at 10 days) Jamaica Plain has transitioned into a hotbed for families and young-professionals. The average sale price in 2018 is over $633,000, but with the large spectrum of pricing, deals still exist. In April, newly renovated 171 South Street Unit 2A sold for $293,000 – a steal for a studio with transit access. Within one week, the property had a cash buyer. On the contrary, recently constructed 16 Rockview Street – Unit 16, sold for $1,450,000 in January. This was the most expensive transaction this year. Today, the average price per square foot is $526, up 7% since 2017. Due to market constraints, average listing prices in June have soared$673,611, indicating the lack of available condos. “This year, the average list price for a condominium in Charlestown is $750,010, with the average sale price reaching $765,383. In the past 6 years, sale prices have surpassed the average list prices by 2%, indicating the high demand for condos in this historic sub-market. Since 2012, the average condominium sale price has increased by 62%, with the average number of sold condos priced over $1m increasing 13% y-o-y. Meet the Archer Residences, 67 very fancy units coming to Beacon Hill in the near future. The Archer’s penthouse, which is currently the most expensive home for sale in the city at a whopping $18 million, is poised to be architectural marvel when it’s completed. Both levels of the home are connected by a floating wood-and-steel staircase enclosed by glass—and the shiny glass accents don’t stop there. Floor-to-ceiling sliding glass doors in the main living area open directly to a rooftop terrace, where there’s a Jacuzzi and an infinity-edge pool. Advisors Living is proud to announce the exclusive sales and marketing of The Archer Residences in Beacon Hill. The Archer Residences, a boutique collection of beautifully designed condominium homes, offers individualized details and a full-service concierge experience in Beacon Hill, one of Boston’s most desirable neighborhoods. From the magnificent roof terrace to the state-of-the-art fitness and wellness center, valet service, and exclusive indoor parking, The Archer Residences are designed to make life easier. From The Archer Residences, many of Boston’s greatest attractions are just a short walk away. Feeling the team spirit? Enjoy the Celtics and the Bruins, two of America’s most successful and historic teams, at TD Garden. Or maybe you just want to take a relaxing stroll around the historic neighborhood? The Boston Public Garden, built in 1837, is a beautiful public park that offers boat rides around its swan-filled lagoon. Louisburg Square, a quiet, historic green near The Archer Residences, was once home to many famous 19th century figures, including architect Charles Bulfinch, painter John Singleton Copley, and author Louisa May Alcott. The Archer Residences features 67 unique residences ranging in size from one to four bedrooms. Each residence has been thoughtfully designed, blending the historic character of Beacon Hill with an elegant hand-selection of materials and finishes. Click here to schedule an appointment or call us today at 888-749-4805 to visit our sales center today at 20 Ashburton Place. We look forward to showing you what makes The Archer Residences the most exciting residential new construction project in Boston. 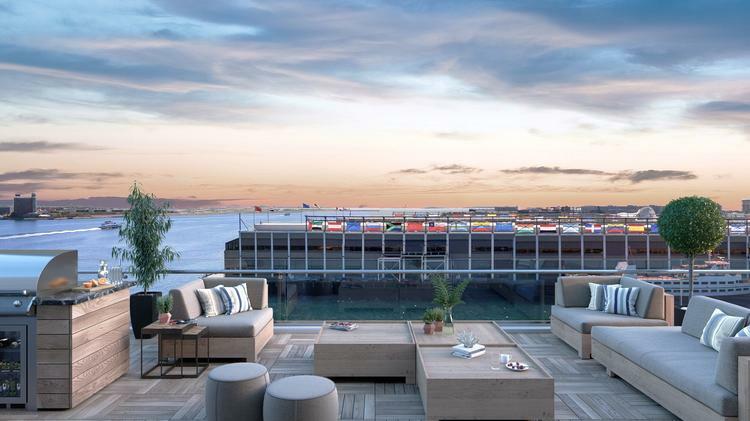 The longtime home of legendary Boston seafood restaurant Anthony’s Pier 4 is rapidly transforming into a luxury condominium complex, and the site’s developer just landed a lease with farm-to-table restaurateur Kristin Canty. Interest is strong for the Pier 4 condos, said Janice Dumont, CEO of AdvisorsLiving. The firm, which is the residential division of Boston Realty Advisors, is the exclusive sales and marketing agent of the nine-story, 106-unit complex. Pier 4, a nine story, 106-unit luxury condominium building, will open in late 2018 at the former Anthony’s Pier 4 site in Boston. Tishman Speyer is developing the complex, which was designed by SHoP Architects in collaboration with Boston-based CBT. “Given the nostalgia of the site, and the fact that so many people have had wedding receptions, bar mitzvahs, confirmations, at the site, it’s been very exciting,” Dumont said in an interview with the Business Journal. Two-bedroom units at Pier 4 will start at $2 million-plus. Each home has its own private outdoor space and water views, and penthouse units will feature private roof decks. Amenities include an outdoor terrace, an outdoor seating and dining area with a fire pit, virtual golf and 24-hour concierge services from First Service Residential. The nationwide trend of real estate agencies mergers and acquisitions came to Boston this month with Douglas Elliman’s announced purchase of local Otis & Ahearn Real Estate. Smaller firms are feeling the pinch from rising costs and market forces, and more consolidations are likely. The increased attention from out-of-town players has been a major topic of conversation around the watercooler at Boston Realty Advisors, said Jason Weissman, founder and senior partner – and he couldn’t be happier about it. Boston Realty Advisors in the largest independent brokerage in the city as measured by gross commission income, Weissman said, and he has also been approached by other companies looking to acquire it. He’s not interested. In fact, he’s actively looking for companies to acquire. Gibson Sothebys is also in acquisition mode. Co-owner and chairman Larry Rideout said his company is not looking to be acquired, but he does see more acquisitions in Boston’s future. Rideout said the white-hot Greater Boston real estate market can’t burn forever, but he thinks the signs point toward a few more good years. Companies that make smart acquisitions now will cash in on those good years. As Boston has become a more international city, Rideout said having the money and the network to market globally has become vital. Small, local companies just don’t have the same reach, making it harder for them to compete. Deep pockets and a global reach are not as important as growing a local base of satisfied customers, she said. Big firms like Douglas Elliman and Berkshire Hathaway, who are both in acquisition mode, don’t bring that to the table. Douglas Elliman did not respond to requests for comment. The trend of smaller companies being consumed by larger ones will continue in Boston, said Jeff Heighton, regional vice president and Boston-area general manager at Compass Real Estate. The Greater Boston economy is growing quickly and big companies are looking to capitalize on that. Growing a business by acquisition is far more complex than simply buying an agency and changing the flag, he said. “I’d say we’ll see more acquisitions in the near future at all levels as agents ask their firm, ‘What are you doing to grow my business?” Heighton said. “As that question can’t be answered, they’re going to look for companies that can. That’s part of what’s driving the consolidations. Welcome to Boston, tech wizard/financial planner/GE executive! Your new apartment has elegant fixtures, stainless appliances, underground parking, a fireplace, and a view of the harbor in a gleaming new building. All over Greater Boston, luxurious new living quarters are sprouting up like gleaming, modernist weeds. And a lot of them, for reasons that aren’t entirely clear, have names. Not names like the apartment building you may have grown up in — “23 Stanley Street” — but Names. The Eddy. VIA. TROY. The Kensington. Watermark. Alloy. The Allele. Allele is, of course, Adele’s less talented younger sister (you may have heard her hit song: “Hello. It’s me . . . Allele”). No, that’s not right. Since most Americans are fluent in the chromosomal genetic science, we obviously know that an allele is (Googles frantically) a different version of a gene. Somewhere along the way, we started naming our cats like people and our people like cats. “Meet my son, Plank, and my cat, Bruce.” Now we’re naming our apartment buildings like swanky hotels. Pretty soon hotels won’t even have names, just a picture of a buffalo that looks like a caveman drew it. And because the marketing of high-end apartments and condos sometimes hinges on a little panache, the names race is on. Remember the “Mad Men” episode where Don Draper sells a slide projector with a speech so thoughtful and impassioned that it sent an ad executive scurrying away in tears? It’s sort of like that, but for high-rises. Cortes and his team whittle down a list of maybe a hundred names to about a dozen that they bring to their clients. KORN named the Liberty Hotel — it seems obvious now, but when it was an abandoned, rat-infested jail next to the hospital, it didn’t scream “luxury hotel” or “liberty.” Alloy, at Assembly Row in Somerville, was so named because it represents the “fusion” of Boston and Somerville, Cortes said, and echoes the area’s industrial history. The Eddy, he said, emerged from historical research and calls on three different ideas. Eddy, most simply, sounds a little like Eastie, the neighborhood where the building sits on the water. Robert Henry Eddy, an architect and civil engineer, worked on various early maps of East Boston in the 19th century. And “eddy” describes circular movement in water running counter to the main current. But they can’t all be this deep. Right? Lars Unhjem, vice president of development in Boston for Mill Creek Residential, said Modera Medford earned its name because “Modera” is Mill Creek’s flagship brand nationally (the Medford part is self explanatory). This all started happening in earnest during an earlier building boom, said Colleen Barry, chief executive officer of Gibson Sotheby’s International Realty. “It was the very early stages of a slightly different way of thinking about development,” Barry said. As it happens, Kelleher credits Barry with naming The Allele. The Allele’s name, Kelleher said, grew from a discussion about the building’s concept: All the best elements of loft living (high ceilings, open floor plans) without the drawbacks (sleeping in what is essentially the far corner of the kitchen; commune-level privacy). But not according to one of the world’s leading geneticists. Dr. Stephen Elledge is the Gregor Mendel Professor of Genetics at Brigham and Women’s Hospital and Harvard Medical School. He’s also a 2017 recipient of the Breakthrough Prize, which “recognizes paradigm-shifting discoveries in the life sciences, physics, and mathematics,” according to the Harvard Gazette. The board is a who’s who of tech billionaires, and the prize comes with $3 million. In an e-mail that was surely a profound waste of his very valuable time, Dr. Elledge said collections of alleles account for differences between people — height, eye color, etc. Many of those differences aren’t inherently good or bad. It is, by all accounts, a lovely place to live.